Location: Located at the N end of Tollgate Park. Lombardic-style chapel built in 1838 as part of the planned village of Groes, which replaced Margam village when C R M Talbot decided to enlarge Margam Park. The village was designed by the architect Edward Haycock, but Talbot is said to have had an input into the design of the chapel, the octagonal form possibly based upon the Chapter House at Margam. It was built at a cost of £800 by Thomas Jenkin, using material from the estate. The chapel was taken down in 1974 in advance of M4 motorway works, and was rebuilt in Tollgate Park, Margam, in 1976. Also known as the Round Chapel. Octagonal chapel of coursed sandstone with hipped slate roof. Ashlar angle pilasters rising to a pronounced Lombard cornice with false machicolations. The roof has projecting eaves and is surmounted by a bell cupola with tall finial. The entrance is to the W under a round voussoir head. Planked double doors with matching tympanum. Fixed above the doorway is an oval stone tablet reading: 'Beulah Calvinistic Methodist Chapel Built at Groes 1838, Dismantled and rebuilt on this site 1976.' Each of the remaining bays has a pair of tall round-headed lights with voussoirs rising from shared imposts, with horizontal wooden glazing bars. There is an oculus at high level to each side. Small entrance bay with tiled floor. Double panelled half-lit doors lead into the chapel, and a panelled door to the R leads to the straight gallery stair. The gallery is supported on 2 cast iron columns with ringed capitals. It has a straight wood-panelled front with clock in centre and a moulded hand rail, and 5 tiers of pews with a central aisle. Attached to the rear wall is a stone tablet, probably the original, reading 'Beulah / Calvinistic Church / 1838'. Wooden pulpit at opposite end with small recessed panels and chamfered projecting front. Three banks of pews with aisles which converge towards the pulpit. The pews have decorated bench ends. The ceiling has high moulded coving and an ornate plaster ceiling rose with foliate decoration. 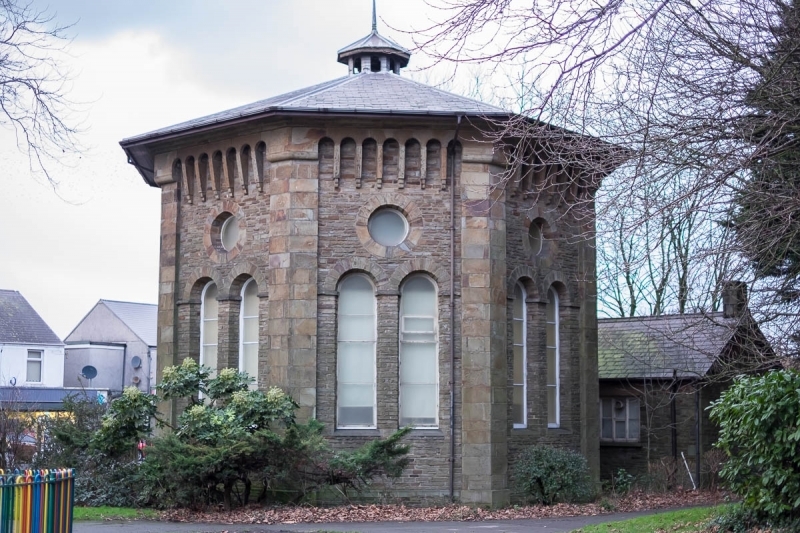 Listed grade II* as the only surviving octagonal chapel in Wales, and a special example of the round-arched style in chapel architecture. Located in Tollgate Park immediately N of Beulah Chapel and almost adjoining. Forming an enclosure in front of the entrance to Beulah Chapel. Alongside the road. Located immediately outside Tollgate Park against the boundary fence. Located on the pavement near the junction with Heol yr Orsedd. Located on the E side of the lane which leads to St Mary's Abbey Church. The W gable end of the building faces the road.